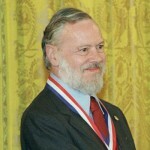 Dennis Ritchie was the creator of C, the programming language and a key developer to the Unix operating system and died today. Even if most people don’t know him, even a lot of programmers don’t know his name, his contribution to the computer science is gigantic, not easily comparable. The C programming language was one of the most important leaps forward of the computers programmers, and most languages used today have a big influence of C. But, more than that, the language made the act of programming computers easier and faster. And the language, as well as its author (Dennis), constituted important contributes to the invention of the Unix Operating System, that was later copied and reimplemented several times, including in its most famous today implementation, Linux, that is used by milions of users world wide, including as basis for the Google Operating system android. I was born in the same years as Dennis, with Brian Kernighan, published the book The C Programming Language, and only several years later, in the 90s, I started programming, and even if C was not my first programming language – Basic, on my spectrum was – C was one of the language I learned, it is still learned in most computing masters around the world. And the book, not being all present as I’m told it was in other days, is still a very good reference for those learning how to program in C.
His book was also responsible by one of the most common styles of programming used until this day in several programming language, K&R – from the last name of the authors. c programming, dennis ritchie, unix. Bookmark.